The 5 Point Scale is a visual tool for defining gray (or abstract) concepts. In our program, we use it most commonly for feelings and voice volume. It can also be used for obsessions, proximity, social and/or dating interactions, anxiety, etc. It is a great tool for helping individuals learn to regulate themselves! 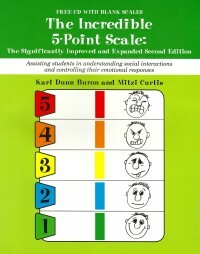 This scale was created by Kari Dunn Buron and Mitzi Curtis and is discussed and broken down in these two great books! The green book is the newest edition.